How about a virtual trip to the Arabian peninsula? 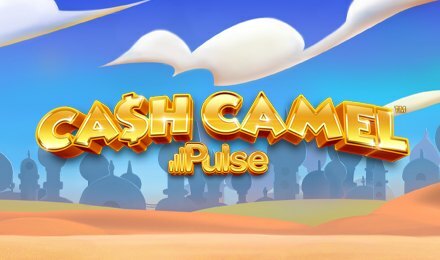 Be entertained by the panoply of fun that is in store for you on Cash Camel Slot! Once you load the game, you are greeted by the exceptional Arabian design, full of colours. The background overlooks a vast desert with a blue sky and clouds above. Plus, you will find some Arabian-style buildings. The set of symbols that you will encounter on this iSoftbet creation is Reptiles, Snakes, Scorpions, Dogs and the usual high-ranking cards. Have some gamesome leaps and gambols on Cash Camel Slot at Wicked Jackpots! Glory in the gameplay of Cash Camel Slot by logging into your account on Wicked Jackpot! To get started, you must select your preferred bet amount! Once you are set, hit on the Spin button to have a whale of a time. What’s more? There is an Auto Spin Feature where you can pick numerous game rounds to play automatically. This astounding feature can be stopped at any time. Bet Levels: Cash Camel Slot doesn’t include any Bet Levels. Amount of Paylines Selection: The 20 paylines remain enabled from the start of the game till the end. Coin Values: Coin sizes vary from a minimum bet value of £0.20 up to a maximum of £20.00. The Sultan Cactus icon acts as the Wild Card of the game. It is also known as the Wild Wally. Plus, it substitutes for all other symbols when making its apparition on the reels to complete winning combinations, bar the Scatter Symbol. The friendly Cash Camel is the Scatter Symbol, which is key to activating one of the most significant bonus rounds on Cash Camel Slot. This astonishing round becomes active upon landing 3, 4 and 5 scattered Cash Camels anywhere on the reels. You are then awarded 10, 20 or 30 free spins respectively. If more Scatters like 1, 2, 3, 4 or 5 appear again, you can be granted 1, 2, 10, 20 or 30 additional free spins correspondingly. Plus, if you hit a stacked Wild Wally symbol on reel 3, you can benefit from a maximum multiplier of 10x. Whenever the wild cactus shows up on reel 3, you will get to pick one of the barrels shown which will award 5, 7, 8 or 10 free spins. Here, reel 3 is entirely wild and any wins will reward a further free spin with those winning symbols locked in place. Get a kick out of Cash Camel Slot and have some spinning exhilaration!